1. What is My Affiliate Account? My Affiliate Account is similar to your account at our store. It stores information about your activity or inactivity as our potential or active affiliate (active partner). If you are inactive, your account will look the same. The choice is completely yours and there are no obligations here. All who enter our store through our affiliates system will receive a 20% discount on their first purchase and 5% on subsequent purchases. 2. How do I become an active affiliate? You become an active affiliate by sending invitations to friends to check out our store and maybe buy something. To do this, click on the My Affiliate Account button (if using a tablet or phone, click the button below to re-open all the account options). Then click on My Invitations, which opens a new page where you’ll find a link to the store (this is only your link, which keeps track of new customers you bring to the store). Below, you’ll find the mail form[ to send mails/invitations to your potential customers (friends or acquaintances. 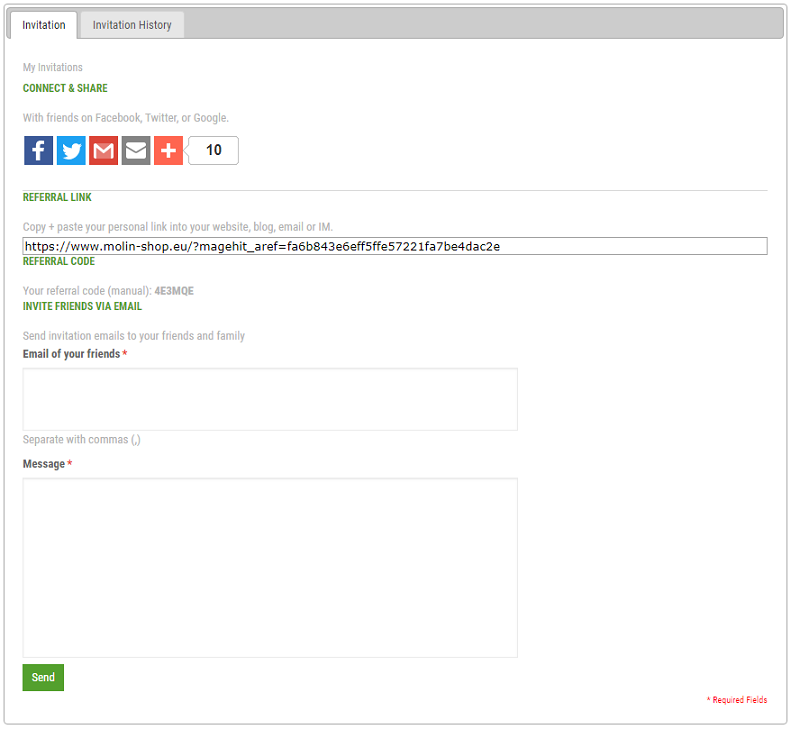 Above, you’ll find links to various social networks, via which you can also send invitations.) You might also want to write your purpose for sending it or recommend a specific product they may be interested in. Via your invitation, they will receive a discount that can be applied upon registration. This info is found in the chart under My Affiliate Programs: look for Customer Discount* (these discounts will only be altered if necessary). 3. How much can I save or buy cheaper in the molin-shop.eu online store? By inviting people to purchase our products according to the instructions given in point 2, you gain potential customers. When these people register and make their first purchase with your discount code within 30 days, you’ll receive 10% of their final purchase value on your Affiliate Account. The new customer discount is given when a new invited Affiliate Partner, and only available upon the first purchase, but you’ll receive 10% in your account every time the customer that you invited makes a purchase (note this does not apply if that person was first invited by someone else). This commission is yours for as long as our store exists and will not change in terms of percentages. The more customers you get, the more discounts you get, and these can be applied to your purchase order immediately. To get even more discounts and earn money, simply explain to your customers how they can do the same. See more in point 4. 4. How can I earn as an affiliate in the molin-shop.eu online store? Simply read through points 2 and 3, follow the instructions, and you’ll be on the right track to earning. As anywhere else (perhaps with a few exceptions such as winning the lottery or inheriting a fortune from some distant relative), nothing is just given away here either. It’s going to take a bit more effort to earn good profits than just to get discounts. You’ll need to acquire more direct customers and explain them the details of how they can buy cheaper and make money too. Why try to help your customers get these discounts and earn money too (to do the same thing as you)? Because our affiliates program is a multi-level program (more precisely, 5 levels), which means you get a commission all until level 5. Your directly acquired customers are your level one customers; and you’ll receive a commission of 10% from all their purchases. Level 2 customers are those acquired by your level one customers; and you’ll receive 3% from all their purchases. In the same way, you’ll receive 1% from your level three customers, 0,75% from your level four customers and 0,50% from your level five customers. This info is found in the chart under My Affiliate Programs; look for Commission Earned* (these percentages will remain unchanged). We made a sample calculation for all five levels, assuming you’ve gained five customers, who each spend €25 per month (let’s say they buy Arelesin 50 ml, which is sufficient for a 1-month supply), achieving level one. Of course, in practice, there are many ways how things can turn out, but the fact is that if you start with something like 30 customers at level one and show them all that it it’s not so difficult, you can make some nice earnings. On top of these fixed percentages, our best affiliate partners will be rewarded even further. 5. Why choose our affiliate program to make extra earnings? There are already quite a few affiliate programs around the world, where you can earn extra cash in a similar way. Most affiliate programs are embedded in the computer and IT industry, which essentially means purchasing computer hardware or software. In these cases, we need to know that each acquired customer will usually only make one purchase; even if completely satisfied, there won’t be a need to buy another program next month. With Molin products, our satisfied customers will return and make purchases approx. on a monthly basis (50 ml is sufficient for 1 month regular use). However, the range of products will continue to expand (the following two products: for regulating thyroid activity and for managing menopause problems), which means more potential customers and thus higher earnings for you. Companies are expected to issue a bill based on their earnings. Natural persons are paid on the basis of their prior agreement, of course only in accordance with national laws and regulations.